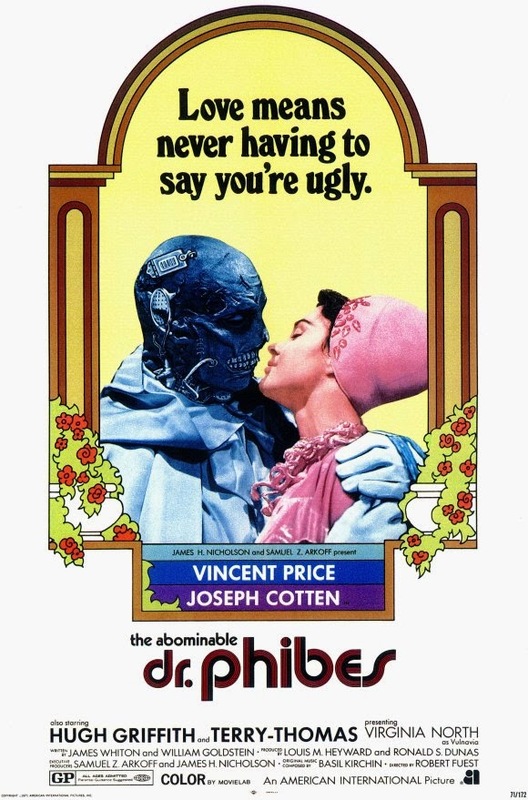 Tag line: "Revenge Is The Best Medicine"
The most bizarre role of Vincent Price’s career is arguably the titular character in 1971’s The Abominable Dr. Phibes. A professional musician driven to the brink of madness by the death of his beloved wife, Victoria (an uncredited Caroline Munro), who died on the operating table, Phibes sets out to destroy the doctors he holds responsible for her demise. A team of nine surgeons and nurses took part in the operation that tried (and failed) to save Victoria’s life, so Phibes, who’s also a scholar of theology, settles on the nine plagues of Egypt as the instrument of his revenge. With the help of his beautiful assistant, Vulnavia (Virginia North), Phibes finishes off the doctors one-by-one, and usually in gruesome fashion. Inspector Trout (Peter Jeffrey) is assigned to investigate the murder of the second victim, Dr. Dunwoody (Edward Burnham), but as the bodies continue to pile up, he realizes there’s a connection linking each of the seemingly random killings. So Trout pays a visit to Dr. Vesalius (Joseph Cotton), who was the lead surgeon during Victoria’s operation. For years it was assumed Phibes himself was also dead, killed in a car crash while rushing to his wife’s side. But when all the evidence points to him as the murderer, Trout and Vesakius do everything they can to find the elusive Phibes and stop him before he strikes again. The kill scenes in The Abominable Dr. Phibes are extremely clever. The first on-screen murder is that of Phibes’ second victim, Dr. Dunwoody (the first to perish, a Prof. Thornton, is already dead when the movie begins). While lying in his bed one evening, Dunwoody is attacked by dozens of bats, which were released into the room by Phibes (bats creep me out in a big way, and to see them crawling around on Edward Burnham’s chest was almost more than I could stand). From there, the deaths become even more elaborate; at a costume party, Dr. Hargreaves (Alex Scott) puts on a frog mask that crushes his head, while Dr. Longstreet (the usually funny Terry-Thomas) has every last drop of blood drained from his body. With nine victims in all, The Abominable Dr. Phibes never slows down, giving us one effective kill after another, and saving some of the most creative for last (the locusts’ scene is especially good). Rising above it all, however, is Vincent Price, who, despite his lack of dialogue, is plenty sinister as Dr. Phibes, gleefully carrying out his heinous crimes in near-total silence (the car accident left him unable to speak, so Phibes created a contraption that plugs into his throat and mimics his voice, allowing him to talk, but only when he’s home). From the moment he first appears on-screen, flailing away at a pipe organ, its obvious Phibes is a little unhinged, and Price clearly relishes the role. A master at merging sophistication with the macabre, Vincent Price played some great characters throughout his career, yet none quite as menacing as Phibes, perhaps the maddest mad doctor in motion picture history. Saw this on TCM recently. VP is just sooo good when he's bad. One of my favorite Vincent Price performances. Just a fun movie, to boot.